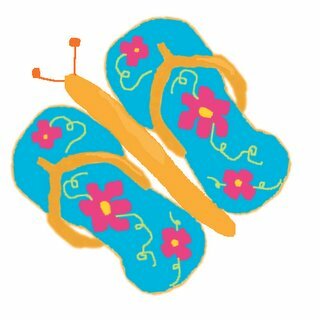 Just a Fat Girl in Flip Flops: Illustration Friday - "Insect"
This week's Illustration Friday entry is the "Beach Butteryfly Flip-Flopiuos." Another try at digital art using Paint Shop pro. I really need to buy a Wacom tablet if I keep up with this... yikes! Not sure which I like better...the name of the work or the drawing. Both are much fun! Thanks for sharing! wow i luv this piece, i luv the incorporation of flip flops into your drawing, do you own a lot of flip flops? I DO!!! good work! Very cute idea. I like your consistency; you must really love flip flops! Ha! This gave me a big smile. Great job. Cute. Thanks for the link and comment on my blog! I'm definitely going to have to look into the whole raised bed thing - I hadn't even considered that before.